Make your day most memorable at the Country House Restaurant. Each Wedding is Custom Designed! The Country House is proud to host year round, custom boutique style weddings. Exchanging vows outside in our beautiful "Enchanted Grove" or in front of our three century old roaring fireplace could not be more romantic. Enjoy your cocktail hour indoors or outside in our lush front yard. 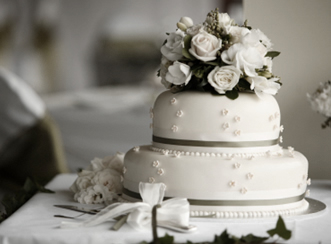 All wedding cakes are custom designed and beautifully adorned. Daytime weddings are 12 p.m. to 4 p.m. and evening weddings are after 5 p.m. to closing.